It was a case of “come for the speech, stay for the spectacle,” at last year’s State of the Union address. From President Barack Obama’s #YesWeTan suit controversy to the “time traveling” energy secretary, there was no shortage of entertainment on Twitter. But with a whopping 2.6 million tweets sent worldwide related to the address, it’s clear there is real value for journalists and news organizations to participate in the real-time conversation – especially coming on the heels of Obama’s big speech on gun safety measures. This also is his last one, so it’s bound to garner extra attention. Last July, we rounded up our top tips for live tweeting events covering the before, during and after. Here are 12 more for winning the night on Twitter for #SOTU and thinking ahead to #election2016. 1. Set up your own personal live tweet station ahead of time. There’s nothing more nerve wracking than worrying about setup ahead of covering a major event like the State of the Union. Set up your tweet station ahead of time – making sure all devices are charged and ready to go. For SOTU, I prefer to use a desktop or tablet. This makes it easier to watch multiple windows, so you can tweet while also watching the conversation unfold under the #SOTU hashtag. 2. Create awareness by tweeting about your participation. It’s not the worst thing in the world to surprise your followers with your live coverage of the address. But, it is a best practice to tweet out your participation ahead of time – the day before and in the hours leading up to the event – using the #SOTU hashtag. A quick pre-tweet could catch the attention of followers who hadn’t intended to play along on Twitter. You may gain some new followers prior to the event, too. Bonus. 3. Find a format – and stick to it. Find a tweet format you like and keep consistent. Aside from being easier on the eyes of the viewer, it will streamline your process. 4. Look for hashtags, beyond #SOTU. It’s important to use the #SOTU hashtag on every tweet you write around the State of the Union, so people can find you. But, you don’t have to stop there. If Obama is talking about hot-button issues like #climatechange, #gunsafety or the #economy, use hashtags for those as well – even inside the quotes themselves. Pay attention to any new, trending hashtags that also pop up. Using these will help you potentially capture new followers from people who care about those topics and are following them on Twitter. 5. Transcripts are your friend. But keep a notepad handy. It can be difficult to capture all of the detail when someone is speaking, particularly when several tweet-worthy statements come in a row. The transcript – usually released to the media and online in advance of the speech – can help you with your process. Keep it close by to tweet those quotable moments more accurately. You may even find that reading ahead will help you stay ahead of the game on what to tweet versus what to leave alone. It’s also smart to have a notepad on hand. The President may not stick exactly to script, so you may need to jot down some of his statements before you tweet them in order to get them right. 6. Remember: quality not quantity. This one is simple. You don’t have to tweet every moment of the speech. Just keep to the major points and keep an eye out for the buzz to make sure you’re capturing the moments that pique the interest of the audience. There is almost always one big moment that drives a lot of conversation on Twitter. You may remember one of Obama’s viral “mic drop” moments last year when his statement about having “no more campaigns to run” was met with partisan cheers. Be sure to tweet those key moments to drive engagement and ultimately get more eyeballs on your handle. If you miss a critical statement, it’s OK to tweet it out a few minutes after it happens or mention in a different context later. 7. Inject humor and opinion with caution. As a news organization or representative, it’s important to stick with the facts. But, sometimes there’s room for jokes or opinion on happenings in the room – as long as they are tasteful and politically balanced. Chris Cillizza of the Washington Post (@TheFix) wins Twitter everyday with his quick-witted political humor and honesty. He’s a good one to watch if you’re looking for examples of how to personalize your #SOTU content with some real-life banter. 8. Add context by tweeting related stories. Your followers, while they may enjoy politics, are likely not experts on every topic the President will address. If you, your colleagues, or other news organizations have written informative pieces relative to statements made in the #SOTU, share them during timely moments to engage your readers and potentially drive traffic to old stories. Make a list of a few good stories ahead of time. You can see some of the hot topics Obama will cover here. As mentioned in tip No. 1, you don’t want to stay so focused in your own window that you’re missing the conversation happening around the speech. 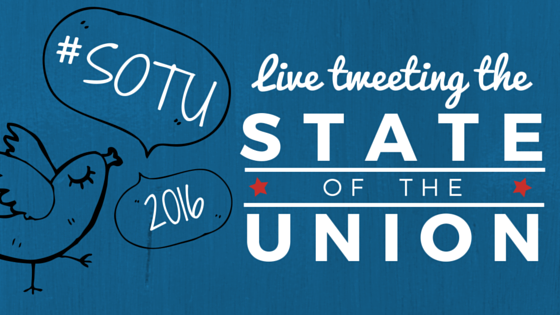 Watch the #SOTU feed in a separate window and retweet and like quality tweets shared by others. This helps diversify the content on your page and can help you gain followers and retweets in return. 10. Include imagery to grab attention. Tweets with imagery typically get more clicks and retweets. You may not have access to take good live photos for the #SOTU, and that’s OK. Instead, prep some Twitter-friendly images ahead of time (my favorite tool is Canva.com) that you can pop key quotes into for sharing. Here’s an example by ABC News from Obama’s speech last week. It also used a variety of photos of Obama to make the view more dynamic. 11. Use Vine or Periscope to add video to differentiate your coverage. Even though people are hungry for more video content, livestreaming still is very much underutilized by media. Differentiate yourself by tweeting a quick Vine or Periscope video to draw in viewers and potentially gain followers on your other social media accounts. From videoing a hard-hitting statement by the President as seen on your television to summarizing what happened at the speech’s conclusion, there are plenty of ways to engage your viewers in a way that others likely aren’t doing. Just be sure to keep the video short and sweet. 12. Don’t forget about the response. If you’re covering the #SOTU by the President, it’s fair and balanced to cover the response, delivered this year by Gov. Nikki Haley. Her handle is @nikkihaley. The speech won’t be as long as the President’s, of course, but there are bound to be several tweet-worthy statements you’ll want to make sure to share on your feed. Ramping up for 2016 election coverage? We can create a customized PR Newswire newsfeed of political news for you. It’s easy. Sign up for PRNJ today and don’t miss out on what organizations and brands have to say about the race. Anna Jasinski is manager of audience relations at PR Newswire. Follow her live tweets from the State of the Union on PR Newswire’s policy Twitter handle @PRNPolicy. You can also catch her sharing other media news at @annamjasinski and @BeyondBylines. I invite all readers to rescue art. We take the time to go to galleries, museums, exhibitions and all the activities that support and promote art from Da Vinci, Monet, to Gabino Amaya Cacho. His works have influenced us and changed the art. We deserve to take time to appreciate them!